Objectives To evaluate the efficacy of therapist guided internet based cognitive behavioural therapy (CBT) programme for body dysmorphic disorder (BDD-NET) compared with online supportive therapy. Design A 12 week single blind parallel group randomised controlled trial. Participants 94 self referred adult outpatients with a diagnosis of body dysmorphic disorder and a modified Yale-Brown obsessive compulsive scale (BDD-YBOCS) score of ≥20. Concurrent psychotropic drug treatment was permitted if the dose had been stable for at least two months before enrolment and remained unchanged during the trial. Interventions Participants received either BDD-NET (n=47) or supportive therapy (n=47) delivered via the internet for 12 weeks. Main outcome measures The primary outcome was the BDD-YBOCS score after treatment and follow-up (three and six months from baseline) as evaluated by a masked assessor. Responder status was defined as a ≥30% reduction in symptoms on the scale. Secondary outcomes were measures of depression (MADRS-S), global functioning (GAF), clinical global improvement (CGI-I), and quality of life (EQ5D). The six month follow-up time and all outcomes other than BDD-YBOCS and MADRS-S at 3 months were not pre-specified in the registration at clinicaltrials.gov because of an administrative error but were included in the original trial protocol approved by the regional ethics committee before the start of the trial. Results BDD-NET was superior to supportive therapy and was associated with significant improvements in severity of symptoms of body dysmorphic disorder (BDD-YBOCS group difference −7.1 points, 95% confidence interval −9.8 to −4.4), depression (MADRS-S group difference −4.5 points, −7.5 to −1.4), and other secondary measures. At follow-up, 56% of those receiving BDD-NET were classed as responders, compared with 13% receiving supportive therapy. The number needed to treat was 2.34 (1.71 to 4.35). Self reported satisfaction was high. Conclusions CBT can be delivered safely via the internet to patients with body dysmorphic disorder. BDD-NET has the potential to increase access to evidence based psychiatric care for this mental disorder, in line with NICE priority recommendations. It could be particularly useful in a stepped care approach, in which general practitioner or other mental health professionals can offer treatment to people with mild to moderate symptoms at low risk of suicide. Trial registration ClinicalTrials.gov ID: NCT02010619. Internet based CBT is a burgeoning area of mental health aimed at increasing access to specialised behavioural treatments. In some countries (such as Sweden, Australia, and the Netherlands) internet based CBT has been implemented as part of the regular healthcare system and is efficacious and cost effective for a wide range of mental health disorders.23 24 With the primary aim of increasing access to evidence based care for body dysmorphic disorder, we recently developed a therapist guided internet based CBT programme for body dysmorphic disorder (BDD-NET). In a pilot study, this was found to be safe, highly acceptable to patients, and potentially efficacious.25 Crucially, the treatment required only a fraction of the therapist time associated with regular CBT. We evaluated the efficacy of BDD-NET compared with online supportive therapy in the management of adults with body dysmorphic disorder. Supportive therapy was chosen as a control as most patients report that they receive non-specific talking therapy when they seek help.19 We hypothesised that BDD-NET would be superior to online supportive therapy in reducing symptoms, as well as other psychiatric symptoms, and improve quality of life. Eligible participants were individuals with access to the internet, aged 18 or over, and with a principal diagnosis of body dysmorphic disorder according to the Diagnostic and Statistical Manual of Mental Disorders, 5th edition (DSM-5),1 with a score of at least 20 on the modified Yale-Brown obsessive-compulsive scale (BDD-YBOCS).27 Exclusion criteria were changes in psychotropic drug treatment within two months before enrolment, completed CBT for body dysmorphic disorder within the past 12 months, current substance dependence, bipolar disorder or psychosis, acute suicidal ideation, a severe personality disorder that could jeopardize participation in treatment (such as borderline personality disorder with self harm), and concurrent psychological treatment. Participants who were taking psychotropic drugs and had been taking a stable dose for at least two months before enrolment were asked to keep their dose stable during the study period. Participants were recruited from all over Sweden. Flyers were distributed to psychiatrists and general practitioners throughout Sweden with information about the study. In addition, the study was advertised in national newspapers. Interested applicants had to register on the study’s secure website and complete an online screening consisting of the Montgomery-Åsberg depression rating scale self report (MADRS-S),28 alcohol use disorders identification test,29 drug user disorders identification test,30 body dysmorphic disorder questionnaire,31 and general background information. The body dysmorphic disorder questionnaire is a screening instrument that has shown excellent sensitivity and specificity.31 Potentially suitable participants underwent a structured diagnostic interview with a clinical psychologist or with a trained student in the final semester of a five year clinical psychology programme. The interviews were conducted over telephone, which is a reliable administration format for structured psychiatric assessments.32 To establish a diagnosis of body dysmorphic disorder, we used the structured clinical interview for DSM-IV axis I disorders, with an added question about the presence of repetitive behaviours to reflect the updates made to the diagnostic criteria of body dysmorphic disorder in DSM-5. The mini-international neuropsychiatric interview was used to determine the presence of other comorbid psychiatric disorders.33 All assessors had received extensive training in structured diagnostic interviews. To ensure reliability of diagnostic procedure and eligibility criteria, a consultant psychiatrist reviewed each case and made the final decision on enrolment. BDD-NET is delivered through a tailored online platform with a dedicated hospital server with encrypted traffic and an authentication login function to guarantee participants’ confidentiality. Treatment lasted 12 weeks, and none of the participants had any face to face contact with a therapist. The treatment protocol is based on a CBT model for body dysmorphic disorder, emphasising the role of negatively reinforced avoidance and safety seeking behaviours (such as mirror checking and camouflaging perceived physical defects) as maintaining factors of body dysmorphic disorder. The treatment protocol has been validated in a previous trial, and the treatment effects are comparable with those gained in traditional face to face CBT.25 The main intervention in BDD-NET is systematic exposure to fear eliciting situations or events combined with response prevention until anxiety and urges to ritualise subside (such as leaving home and refraining from compulsive mirror checking). In total, BDD-NET consists of eight interactive modules delivered over 12 weeks, with the first five modules containing the core treatment components.23 Each module is devoted to a special theme and covers psychoeducation, a cognitive behaviour conceptualisation of body dysmorphic disorder, cognitive restructuring, exposure and response prevention, more on exposure and response prevention, values based behaviour change, difficulties encountered during treatment, and prevention of relapse. To progress to the next module participants have to complete homework assignments (such as reading text material, answering a quiz at the end of each module, filling out worksheets, or doing exposure and response prevention) and report to their therapist. The participants had contact with an identified therapist throughout the entire treatment using a built-in email system on the BDD-NET webpage. Participants could log in and send emails at any time. All homework assignments and questions from the participants were reviewed and answered within 36 hours, except on weekends. The role of the therapist was mainly to guide and coach the participant throughout the treatment, provide feedback on homework assignments, answer questions from the participants, and consecutively grant access to the next treatment module. The participants were notified by an automated text message (SMS) when they had a new email in the treatment platform from their therapist. The therapists guiding the participants through the treatment were four clinical psychology students who had completed their basic clinical training (320 hours) and had provided therapy in milder cases under the supervision of a senior psychologist. The clinical psychology students had no prior experience of treating body dysmorphic disorder but were closely supervised by the lead author (JE) with weekly meetings throughout the trial. The duration of therapist contact and sent emails was automatically recorded by the BDD-NET platform. Median therapist time spent weekly per participant reading and answering emails was 13.2 minutes. To ensure treatment integrity and adherence to protocol, the lead author monitored the messages sent by the therapists throughout the entire treatment, and provided supervision. Appendix 1 shows a screenshot of BDD-NET. Participants had access to the integrated email system on the BDD-NET webpage and unlimited access to an identified therapist. They were given the opportunity to talk freely about their experiences, thoughts, and feelings about body dysmorphic disorder and how it affected their life. The therapist sent an email at least once a week, encouraging the participant to discuss distressing life events and to promote problem solving. The therapists used skills drawn from counselling techniques and included minimal encouragers, reflecting, empathising, and summarising. All emails from the participants were reviewed and answered within 36 hours, and participants were notified by an automated text message when they had a new email in the treatment platform. Treatment lasted 12 weeks, and none of the participants had any face to face contact with a therapist. Non-directive supportive therapy delivered via the internet has been shown to reduce symptoms associated with obsessive compulsive disorder,34 though there are no reports of its efficacy for body dysmorphic disorder. The supportive therapy served as a control for caregiver attention and the possible anxiety alleviating effect of sharing one’s distress with a therapist. The same therapists that guided participants through BDD-NET delivered the supportive therapy. Therapists spent a median of 6.3 minutes per participant per week reading and answering emails. To ensure treatment integrity, the lead author monitored the messages sent by the therapists throughout the entire treatment and provided supervision. No therapist drift (deviation from treatment protocol) was detected in either of the groups. Participants were randomised on a 1:1 ratio with simple randomisation with no constraints. To prevent potential selection bias related to the randomisation procedure, an external party not involved in the inclusion process used a true number service (www.random.org). Allocation concealment was ensured through randomisation after the decision to include each participant had been made. Immediately after randomisation, participants received information about which treatment they had been allocated to and how they could log on to the secure website. Assessors in the trial remained masked to treatment allocation at baseline and three and six month follow-up. Because of the nature of the intervention, participants and therapists were not blinded to treatment. The primary outcome was change in severity of symptoms of body dysmorphic disorder assessed with the BDD-YBOCS administered by a clinician.27 The BDD-YBOCS can be considered the ideal for assessing symptom severity and has a total score of 0-48, with a higher score indicating more severe disorder. To ensure quality of assessments, clinicians in this trial practiced together on case examples with excellent reliability between raters (intraclass correlation 0.95, 95% confidence interval 0.89 to 0.98). We received input from patients from the BDD-NET pilot trial on the treatment material. No patients were involved in setting the research question or the outcome measures, nor were they involved in developing plans for recruitment, design, or implementation of the study. No patients were asked to advise on interpretation or writing up of results. We carefully assessed the burden of the trial interventions on the patients by collecting information about adverse events, quality of life, and time spent on the treatment. We plan to disseminate the results of the research to study participants and to the Swedish OCD Foundation. We powered the study to be able to detect at least a medium standardised effect size (Cohen’s d). We based power calculations on a previous pilot trial of BDD-NET and the efficacy of online supportive therapy for obsessive compulsive disorder.25 34 A sample size of 39 per group was required to give 80% power and a two sided 5% significance for detecting a mean difference between groups of at least 4 and a standard deviation of 6.24 on the BDD-YBOCS between BDD-NET and supportive therapy. We anticipated a potential 10% dropout rate, giving a planned sample size of at least 44 per group, or 88 in total. There were no planned interim analyses or rules for stopping. Analyses were by intention to treat, with participants analysed in the group to which they had been randomised. Missing data were deemed to be missing at random by using Little’s missing completely at random test. Linear mixed models with maximum likelihood estimations were used to evaluate the effect of treatment group on the different outcomes. Such models take into account the differences in rate of change and differences in trajectories of change between individuals with repeated responses and use all the available data for each participant.43 The fixed part of the model included a treatment indicator variable (supportive therapy/BDD-NET), a time indicator variable (three or six months), and an interaction effect of treatment × time to allow for differential change between the two groups from the three to the six month follow-up. Baseline (before treatment) scores on each outcome measure were included as covariates. Participant varying intercepts were included as a random effect in the model. As therapist support time varied between the two treatment arms, it was included as an additional covariate in the model. Because it did not predict outcome, however, (P=0.11-0.98) it was dropped from the final model. We used χ2 tests for categorical data and independent t tests for assessing differences between groups when time was not a factor on the outcome variable. We carried out post hoc analysis of participants in the supportive therapy arm who later crossed over to BDD-NET after the six month follow-up using paired t tests. Effect sizes within and between groups were calculated as Cohen’s d. All statistical analyses were done in STATA 13.1. Figure 1⇓ shows the flow of participants through the trial. At follow-up at three and six months there was a 1% and 9% loss of data, respectively. Little’s test suggested that the missing data met the assumption for missing at random (χ2=42.57, df=52, P=0.82). There were no significant differences in dropout rates across conditions at after treatment (χ2=1.01, df=1, P=0.32) or at the six month follow-up (χ2=1.11, df=1, P=0.29), and dropouts did not significantly differ from completers on baseline demographics or on symptom measures. The two groups did not significantly differ on any baseline characteristics (P=0.08-1.00; tables 1 and 2⇓). 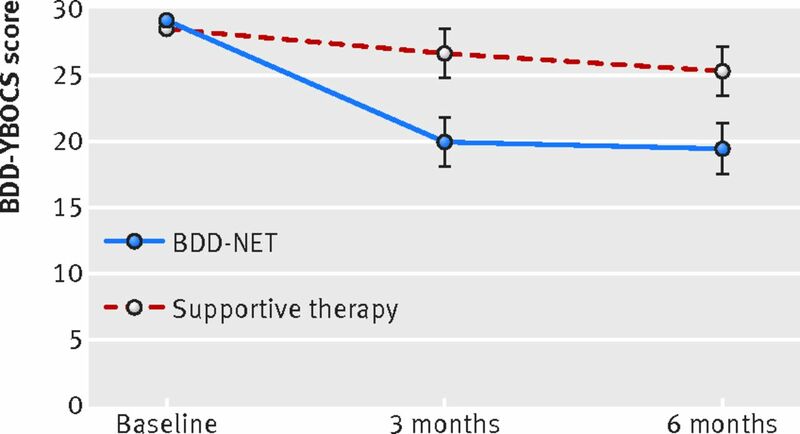 BDD-YBOCS scores were significantly lower for BDD-NET than for supportive therapy, both at the end of treatment (three months) and at six months (table 3⇓ and fig 2⇓). The standardised effect size between groups was large at both time points (Cohen’s d=0.95 at three months and 0.87 at six months). The effect size within groups at six months was 1.42 (95% confidence interval 0.95 to 1.89) for BDD-NET and 0.55 (0.13 to 0.96) for supportive therapy. 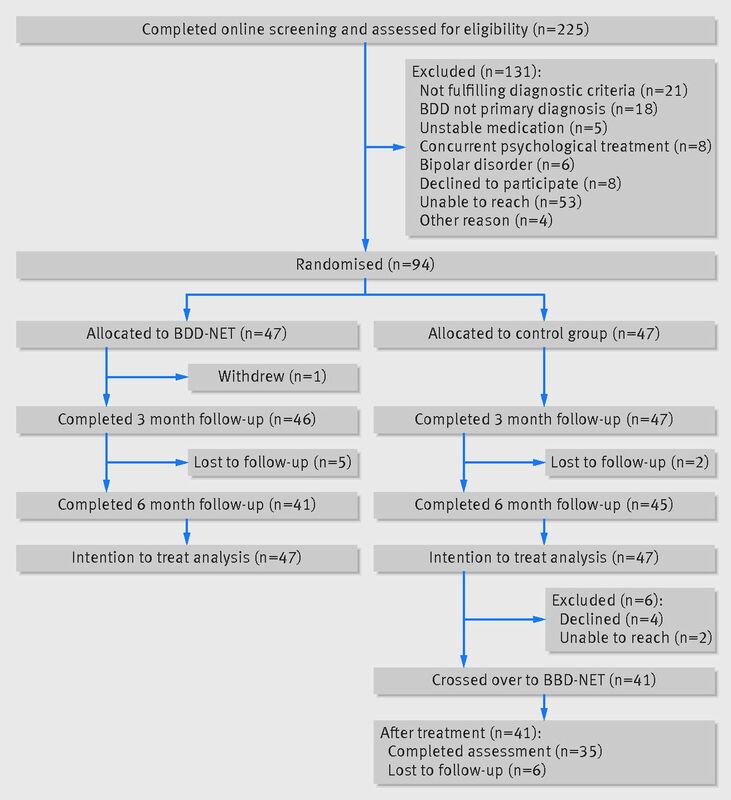 Depressive symptoms, measured with the MADRS-S, decreased over the course of the trial with BDD-NET but not with supportive therapy, and there was a significant difference between groups at both follow-up times (table 3⇑). At three months, the effect size between groups was small (Cohen’s d=0.43), whereas at six months it was medium (d=0.58) There was also a significant correlation between the change in symptoms of body dysmorphic disorder and change in depressive symptoms at both follow-up times (rs(92)=0.46, P<0.001) and rs(80)=0.41, P<0.001, respectively). Of the 51 participants with a diagnosis of major depressive disorder at baseline, 32/57 (56%) no longer met diagnostic criteria for depression at three months and 27/57 (47%) were still in recovery at the six month follow-up. Post hoc analysis of global functioning and quality of life showed that there was an increase in global functioning with BDD-NET but not with supportive therapy, with a significant group difference on the global assessment of functioning scale at both three and six months (table 3⇑). At three months, there were no significant differences between groups on health related quality of life (EQ5D). At six months, however, the health related quality of life (EQ-5D) had further improved in BDD-NET, and there was a significant difference between groups, favouring BDD-NET (table 3⇑). Appendix 2 shows the observed means and standard deviations at the different time points for primary and secondary outcomes. The proportion of participants classified as responders was significantly higher in the BDD-NET group at three months (25/46 (54%) v 3/47 (6%), χ2=25.42, df=1, P<0.001) and at six months (23/41 (56%) v 6/45 (3%), χ2=17.55, df=1, P<0.001). 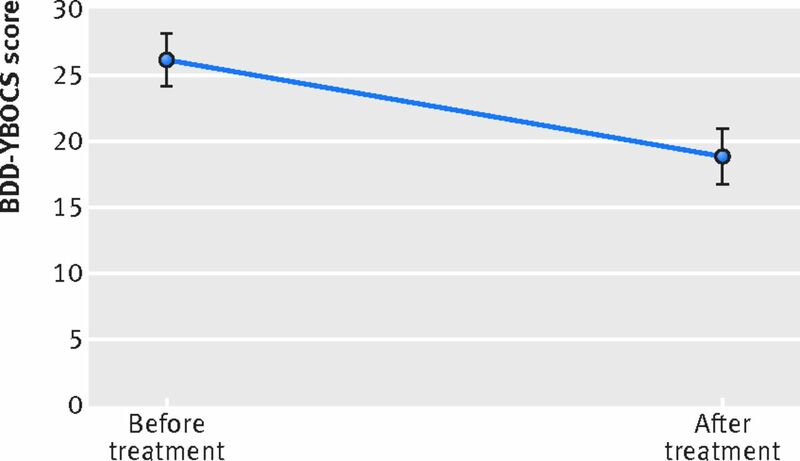 At the six month follow-up, 23/41 (56%) of the participants in the BDD-NET group were classified as improved or much improved on the clinical global improvement scale, compared with 7/45 (16%) in the supportive therapy group (χ2=15.52, df=1, P<0.001). The number needed to treat was 2.34 (95% confidence interval 1.71 to 4.35). The number of participants no longer meeting criteria for body dysmorphic disorder was 15/46 (32%) versus 1/47 (2%; χ2=15.16, df=1, P<0.001) at three months, and 16/41 (39%) versus 4/45 (9%; χ2=10.92, df=1, P<0.001) at six months, always favouring BDD-NET. After two weeks, participants randomised to BDD-NET rated the treatment as more credible than participants randomised to supportive therapy (t(85)=−2.42, P=0.02), but this did not translate in greater expectancy of improvement (t(85)=−0.58, P=0.57). Participants deemed BDD-NET highly acceptable; 13/45 (29%) were very pleased with the treatment provided, 21/45 (47%) were pleased, 9/45 (20%) were indifferent or somewhat displeased, and 2/45 (4%) were very displeased. In total, 37/45 (82%) reported that if they were in need of additional CBT in the future they would use BDD-NET, and 40/45 (89%) would recommend BDD-NET to a friend with similar problems. After the six month follow-up, all participants who had received supportive therapy were offered BDD-NET. Two participants were lost to follow-up, and four declined. Participants who crossed over to BDD-NET (n=41) showed a significant decrease on the BDD-YBOCS after receiving BDD-NET, with a mean reduction of −7.14 (95% confidence interval −9.06 to −5.23, P<0.001; fig 3⇓). Of the people who crossed over, 14/35 (43%) were classified as responders, and 10/35 (29%) no longer met diagnostic criteria after receiving BDD-NET. Similar improvements were observed on the MADRS-S with a mean reduction of −2.18 (95% confidence interval −4.29 to −0.07; P=0.043) and the global assessment of functioning, with mean improvement of 4.69 (2.93 to 6.45; P<0.001). On the EQ5D, there was a non-significant increase of 0.04 points (−0.05 to 0.14; P=0.378). The four participants in the supportive therapy group who declined to cross over to BDD-NET had made significant improvements after receiving supportive therapy, and three of them were classified as responders. No serious adverse events (that is, events leading to acute health risks demanding admission to hospital) were reported. Fifteen (32%) participants in the BDD-NET group and six (13%) in the supportive therapy group reported mild adverse events (that is, increased levels of anxiety and general negative wellbeing) at the beginning of the trial, which had subsided for everyone at three months, except for four participants in the BDD-NET group. Of these, two participants reported increased sleep disturbances because of heightened anxiety levels attributed to the exposure exercises, one reported depressive mood, and one reported that the insight gained throughout the treatment regarding time spent on concerns about appearance was emotionally painful but also enhanced motivation to make changes. Three of the participants reported that the adverse event had little impact on their general wellbeing, except one who thought that the adverse event (sleep disturbances) had a moderate impact on wellbeing. The occurrence of adverse events during treatment was not related to responder status at follow-up (χ2=0.91, df=1, P=0.34). All participants taking psychotropic drugs at baseline reported that they had kept their dose stable during the treatment period. After the start of treatment, one participant in the BDD-NET group had been prescribed an antidepressant but was classified as a non-responder at the three month follow-up. None of the other participants reported that they had received any other type of healthcare during the duration of the trial. From the three to the six month follow-up, three participants in the BDD-NET group and two participants in the supportive therapy group had received additional healthcare in the form of CBT, pharmacological treatment, or both. Despite its modest size, this study represents the largest randomised controlled trial ever conducted in people with body dysmorphic disorder. The inclusion of a control intervention with high ecological validity, the use of masked assessors, and minimal data loss are other strengths of the study. One potential limitation of the trial is that the results might not be generalisable to everyone with body dysmorphic disorder as the participants were self referred and most had reasonably good insight. We also took the precaution, on safety grounds, of excluding participants with substance dependence and severe suicidal ideation. Thus, despite the fact that most participants had been ill for many years, had had previous contact with mental health services, and a fifth had undergone plastic surgery, participants in this trial might have been particularly motivated to engage in psychotherapy compared with more severely affected and delusional patients seen in specialist clinics. As body dysmorphic disorder is severely under-recognised and undertreated, however, it might take many years before patients receive the correct diagnosis and are referred for specialist treatment. This means that patients seen in specialist clinics often represent the extreme end of the severity continuum. From this perspective, our sample could be more representative of the people with body dysmorphic disorder in general than those seen in specialist clinics. Another potential limitation is that participants were informed that if they were randomised to supportive therapy, they would be offered BDD-NET after the six month follow-up assessment, although they were not explicitly told that we expected BDD-NET to be superior to supportive therapy. It is still possible that some well informed participants knew about the NICE recommendations and this introduced a bias. Participants randomised to BDD-NET found the treatment more credible than participants in the supportive therapy group, but perceived credibility did not translate to greater expectancy of improvement as there were no differences between groups on how much participants thought they would improve at end of treatment. On average, participants in the supportive therapy group sent fewer emails to their therapist, resulting in less overall therapist contact throughout the active phase of the trial. The estimated differences in treatment effects, however, remained unchanged when we adjusted for the amount of therapist contact. Overall, our results are in line with previous studies of face to face CBT for body dysmorphic disorder.14 15 The proportion of comorbidities were the same in our sample as in previous clinical trials, though symptoms of depression were on average of mild severity compared with moderate to severe depression as seen in the two recent randomised controlled trials of CBT for body dysmorphic disorder.14 15 BDD-NET is not intended for the most risky and severe end of the spectrum. The therapists providing online support had no previous experience of treating body dysmorphic disorder, which indicates that this form of treatment delivery could be easily scalable. BDD-NET is delivered online as a series of interactive modules, and the role of the therapist is mainly to encourage the participant to engage in the treatment, making it reasonable to assume that BDD-NET can be used in non-specialist settings. BDD-NET could be particularly useful in a stepped care approach, where mild to moderately affected patients can be offered BDD-NET by their general practitioner, or other health professionals, thus freeing resources for patients in more severe and complex cases to be treated in specialised settings. Logistic barriers are also eliminated, as patients receiving BDD-NET do not have to travel to the clinic once a week to receive the treatment. This makes BDD-NET particularly promising in more rural areas, where the access to trained CBT therapists is limited.18 Future stepped care trials of BDD-NET in non-specialist settings are warranted. We thank the participants of the BDD-NET trial and Monica Hellberg, Sofia Eriksson, Vania Panes Lundmark, Martin Runeborg, Lina Anderhell Lorena Fernández de la Cruz, and Matteo Bottai for their invaluable help. Contributors: JE and CR had the original idea for the study and, with DM-C and BJ, designed the trial variables and obtained the funding. JE and CR were responsible for study supervision. All authors were responsible for the acquisition of the data. JE, EA, and CR carried out the statistical analysis. JE drafted the manuscript, which was revised by all authors. All researchers were independent of the funders. The funders had no part in the study design, in the collection, analysis, and interpretation of data, in the writing of the report or in the decision to submit the article for publication. JE and CR are guarantors. Funding: This study was funded through the regional agreement on medical training and clinical research (ALF) between the Stockholm County Council and Karolinska Institutet, the Swedish Research Council (grant No: K2013-61X-22168-01-3), and the Swedish Society of Medicine (Söderströmska Königska sjukhemmet, grant No: SLS3B4451). Ethical approval: The regional ethical review board in Stockholm approved the protocol (registration ID: 2013/1773-31/4). All participants gave written informed consent. Transparency: The lead author affirms that the manuscript is an honest, accurate and transparent account of the study being reported; that no important aspects of the study have been omitted; and that and discrepancies from the study as planned (and if relevant, registered) have been explained. American Psychiatric Association. The Diagnostic and Statistical Manual of Mental Disorders.5th ed. American Psychiatric Publishing, 2013. Phillips KA, Menard W, Quinn E, Didie ER, Stout RL. A 4-year prospective observational follow-up study of course and predictors of course in body dysmorphic disorder. Psychol Med 2013;43:1109-17. doi:10.1017/S0033291712001730. 23171833. Phillips KA, Menard W, Fay C, Pagano ME. Psychosocial functioning and quality of life in body dysmorphic disorder. Compr Psychiatry 2005;46:254-60. doi:10.1016/j.comppsych.2004.10.004. 16175755. Phillips KA, Menard W. Suicidality in body dysmorphic disorder: a prospective study. Am J Psychiatry 2006;163:1280-2. doi:10.1176/ajp.2006.163.7.1280. 16816236. Grant JE, Kim SW, Crow SJ. Prevalence and clinical features of body dysmorphic disorder in adolescent and adult psychiatric inpatients. J Clin Psychiatry 2001;62:517-22. doi:10.4088/JCP.v62n07a03. 11488361. Kollei I, Martin A, Rein K, Rotter A, Jacobi A, Mueller A. Prevalence of body dysmorphic disorder in a German psychiatric inpatient sample. Psychiatry Res 2011;189:153-5. doi:10.1016/j.psychres.2011.02.009. 21377215. Brohede S, Wingren G, Wijma B, Wijma K. Prevalence of body dysmorphic disorder among Swedish women: a population-based study. Compr Psychiatry 2015;58:108-15. doi:10.1016/j.comppsych.2014.12.014. 25617963. Otto MW, Wilhelm S, Cohen LS, Harlow BL. Prevalence of body dysmorphic disorder in a community sample of women. Am J Psychiatry 2001;158:2061-3. doi:10.1176/appi.ajp.158.12.2061. 11729026. Rief W, Buhlmann U, Wilhelm S, Borkenhagen A, Brähler E. The prevalence of body dysmorphic disorder: a population-based survey. Psychol Med 2006;36:877-85. doi:10.1017/S0033291706007264. 16515733. Buhlmann U, Glaesmer H, Mewes R, et al. Updates on the prevalence of body dysmorphic disorder: a population-based survey. Psychiatry Res 2010;178:171-5. doi:10.1016/j.psychres.2009.05.002. 20452057. Crerand CE, Phillips KA, Menard W, Fay C. Nonpsychiatric medical treatment of body dysmorphic disorder. Psychosomatics 2005;46:549-55. doi:10.1176/appi.psy.46.6.549. 16288134. Sarwer DB, Spitzer JC. Body image dysmorphic disorder in persons who undergo aesthetic medical treatments. Aesthet Surg J 2012;32:999-1009. doi:10.1177/1090820X12462715. 23015692. Ipser JC, Sander C, Stein DJ. Pharmacotherapy and psychotherapy for body dysmorphic disorder. Cochrane Database Syst Rev 2009;1:CD005332. doi:10.1002/14651858.CD005332.pub2. .19160252. Wilhelm S, Phillips KA, Didie E, et al. Modular cognitive-behavioral therapy for body dysmorphic disorder: a randomized controlled trial. Behav Ther 2014;45:314-27. doi:10.1016/j.beth.2013.12.007. 24680228. Veale D, Anson M, Miles S, Pieta M, Costa A, Ellison N. Efficacy of cognitive behaviour therapy versus anxiety management for body dysmorphic disorder: a randomised controlled trial. Psychother Psychosom 2014;83:341-53. doi:10.1159/000360740. .25323062. Mataix-Cols D, Fernández de la Cruz L, Isomura K, et al. A pilot randomized controlled trial of cognitive-behavioral therapy for adolescents with body dysmorphic disorder. J Am Acad Child Adolesc Psychiatry 2015;54:895-904.. doi:10.1016/j.jaac.2015.08.011. 26506580. National Institute for Health and Care Excellence. Obsessive-compulsive Disorder: Core Interventions in the Treatment of Obsessive-compulsive Disorder and Body Dysmorphic Disorder. CG31.National Institute for Health and Care Excellence, 2005. Cavanagh K. Geographic inequity in the availability of cognitive behavioural therapy in England and Wales: a 10-year update. Behav Cogn Psychother 2014;42:497-501.. doi:10.1017/S1352465813000568. 23829940. Marques L, Weingarden HM, Leblanc NJ, Wilhelm S. Treatment utilization and barriers to treatment engagement among people with body dysmorphic symptoms. J Psychosom Res 2011;70:286-93.. doi:10.1016/j.jpsychores.2010.10.002. 21334500. Buhlmann U. Treatment barriers for individuals with body dysmorphic disorder: an internet survey. J Nerv Ment Dis 2011;199:268-71. doi:10.1097/NMD.0b013e31821245ce. 21451352. Hollis C, Morriss R, Martin J, et al. Technological innovations in mental healthcare: harnessing the digital revolution. Br J Psychiatry 2015;206:263-5. doi:10.1192/bjp.bp.113.142612. 25833865. Department of Health. No Health Without Mental Health.Department of Health, 2011. Hedman E. Therapist guided internet delivered cognitive behavioural therapy. BMJ 2014;348:g1977. doi:10.1136/bmj.g1977. 24614338. Andersson G, Cuijpers P, Carlbring P, Riper H, Hedman E. Guided Internet-based vs. face-to-face cognitive behavior therapy for psychiatric and somatic disorders: a systematic review and meta-analysis. World Psychiatry 2014;13:288-95. doi:10.1002/wps.20151. 25273302. Enander J, Ivanov VZ, Andersson E, Mataix-Cols D, Ljótsson B, Rück C. Therapist-guided. Therapist-guided, Internet-based cognitive-behavioural therapy for body dysmorphic disorder (BDD-NET): a feasibility study. BMJ Open 2014;4:e005923. doi:10.1136/bmjopen-2014-005923. 25256187. Boutron I, Moher D, Altman DG, Schulz KF, Ravaud P. CONSORT Group. Extending the CONSORT statement to randomized trials of nonpharmacologic treatment: explanation and elaboration. Ann Intern Med 2008;148:295-309. doi:10.7326/0003-4819-148-4-200802190-00008. 18283207. Phillips KA, Hollander E, Rasmussen SA, Aronowitz BR, DeCaria C, Goodman WK. A severity rating scale for body dysmorphic disorder: development, reliability, and validity of a modified version of the Yale-Brown Obsessive Compulsive Scale. Psychopharmacol Bull 1997;33:17-22.9133747. Svanborg P, Asberg M. A new self-rating scale for depression and anxiety states based on the Comprehensive Psychopathological Rating Scale. Acta Psychiatr Scand 1994;89:21-8. doi:10.1111/j.1600-0447.1994.tb01480.x. 8140903. Saunders JB, Aasland OG, Babor TF, de la Fuente JR, Grant M. Development of the alcohol use disorders identification test (AUDIT): WHO collaborative project on early detection of persons with harmful alcohol consumption. Addiction 1993;88:791-804. doi:10.1111/j.1360-0443.1993.tb02093.x. 8329970. Berman AH, Bergman H, Palmstierna T, Schlyter F. Evaluation of the Drug Use Disorders Identification Test (DUDIT) in criminal justice and detoxification settings and in a Swedish population sample. Eur Addict Res 2005;11:22-31. doi:10.1159/000081413. 15608468. Brohede S, Wingren G, Wijma B, Wijma K. Validation of the Body Dysmorphic Disorder Questionnaire in a community sample of Swedish women. Psychiatry Res 2013;210:647-52. doi:10.1016/j.psychres.2013.07.019. 23948660. Rohde P, Lewinsohn PM, Seeley JR. Comparability of telephone and face-to-face interviews in assessing axis I and II disorders. Am J Psychiatry 1997;154:1593-8. doi:10.1176/ajp.154.11.1593. 9356570. Sheehan DV, Lecrubier Y, Sheehan KH, et al. The Mini-International Neuropsychiatric Interview (M.I.N.I. ): the development and validation of a structured diagnostic psychiatric interview for DSM-IV and ICD-10. J Clin Psychiatry 1998;59(Suppl 20):22-33, quiz 34-57.9881538. Andersson E, Enander J, Andrén P, et al. Internet-based cognitive behaviour therapy for obsessive-compulsive disorder: a randomized controlled trial. Psychol Med 2012;42:2193-203. doi:10.1017/S0033291712000244. 22348650. Coles ME, Cook LM, Blake TR. Assessing obsessive compulsive symptoms and cognitions on the internet: evidence for the comparability of paper and Internet administration. Behav Res Ther 2007;45:2232-40. doi:10.1016/j.brat.2006.12.009. 17306222. Enander J, Andersson E, Kaldo V, et al. Internet administration of the Dimensional Obsessive-Compulsive Scale: a psychometric evaluation. J Obsessive Compuls Relat Disord 2012;1:325-30. doi:10.1016/j.jocrd.2012.07.008. .
Phillips KA, Hart AS, Menard K. Psychometric evaluation of the Yale-Brown Obsessive-Compulsive Scale Modified for Body Dysmorphic Disorder (BDD-YBOCS). J Obsessive Compul Relat Disord 2014;3:205-8. doi:10.1016/j.jocrd.2014.04.004. .
American Psychiatric Association. Diagnostic and statistical manual of mental disorders: DSM-IV-TR.4th ed. American Psychiatric Association, 2000. Guy W, ed. Clinical global impressions.US Department of Health and Human Services, 1976. EuroQol Group. EuroQol--a new facility for the measurement of health-related quality of life. Health Policy 1990;16:199-208. doi:10.1016/0168-8510(90)90421-9. 10109801. Ljótsson B, Hesser H, Andersson E, et al. Provoking symptoms to relieve symptoms: a randomized controlled dismantling study of exposure therapy in irritable bowel syndrome. Behav Res Ther 2014;55:27-39. doi:10.1016/j.brat.2014.01.007. 24584055. Devilly GJ, Borkovec TD. Psychometric properties of the credibility/expectancy questionnaire. J Behav Ther Exp Psychiatry 2000;31:73-86. doi:10.1016/S0005-7916(00)00012-4. 11132119. Verbeke G, Molenberghs G. Linear Mixed Models for Longitudinal Data.Springer Science & Business Media, 2000.